Millionaire industrialist Steven Taylor is a man who has everything but what he craves most: the love and fidelity of his wife. A hugely successful player in the New York financial world, he considers her to be his most treasured acquisition. But she needs more than simply the role of dazzling accessory. Brilliant in her own right, she works at the U.N. and is involved with a struggling artist who fulfills her emotional needs. When her husband discovers her indiscretion, he sets out to commit the perfect murder and inherit her considerable trust fund in the bargain. Very little is what it seems in this thriller that is sizzling with suspense. Starring Academy Award and Golden Globe-winner Gwyneth Paltrow ("Proof," "Shakespeare in Love"), Academy Award and Golden Globe-winner and Emmy-nominee Michael Douglas ("The In-Laws," "Don't Say A Word") and Viggo Mortensen ("Hidalgo," the "Lord of the Rings" trilogy). 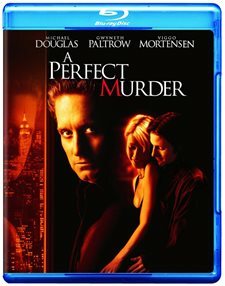 Download A Perfect Murder in Digital HD from the iTunes store. A Perfect Murder images are © Warner Bros.. All Rights Reserved. A Perfect Murder is based on the same 1952 stage play by Frederick Knott that Alfred Hitchcock memorably filmed as Dial M for Murder. Hitchcock kept the play's title and much of its dialogue, and he also retained its limited setting, where most of the action was confined to a London apartment inhabited by an unfaithful wife and her homicidally vengeful husband. Despite strong performances by Grace Kelly and Ray Milland, the film gets stolen from both of them in the third act by English veteran John Williams, whose Chief Inspector Hubbard unravels the elaborate plot through a painstaking analysis of latch keys. The new version directed by Andrew Davis updates the setting to 1990s New York City and borrows a few plot points from Knott's play (the cheating wife, the vindictive husband, the business with keys), but it fails to achieve the one thing that makes Dial M for Murder a classic: suspense. The narrative rot that had been steadily infecting Hollywood had progressed to the point where even the director of The Fugitive was no longer allowed to generate tension the way Hitchcock did, that is, by giving the audience all (or nearly all) of the relevant information up front. Scripts have to be crammed with repetitive twists, reveals and game-changers, so that, instead of investing in a character's situation, audiences have gotten used to sitting back and waiting for the next switcheroo. Indeed, the script becomes so hollow, by the end of the film, the only thing viewers feel for is the unhappy couple's fabulous apartment. It's more interesting than any of the characters. Perhaps as a nod to Psycho, the film opens outside the Brooklyn loft of artist David Shaw (Viggo Mortensen), which the camera then enters through a window to find a couple stealing an afternoon together: Shaw and his lover, Emily Taylor (Gwyneth Paltrow), the much younger "trophy" wife of international currency trader, Steven Taylor (Michael Douglas). Emily, too, has an international job; she works as a translator at the United Nations with her best friend, Raquel (Sarita Choudhury). From afternoons with Shaw, Emily returns to the lavishly appointed Fifth Avenue apartment she shares with Steven. Herself a child of wealth and privilege, Emily looks smashing on Steven's arm as they attend high-toned functions among the elite of Manhattan. One of them is a charity ball at the Metropolitan Museum of Art, where Shaw is present, and Emily is forced into the awkward position of introducing her husband to her lover. But Steven knows all about Shaw. He's the kind of Wall Street shark who prides himself on being a step ahead of everyone around him. On the pretext of looking at Shaw's work, he visits Shaw's studio and confronts him about Emily. Then he makes Shaw a shocking offer: Steven will pay the artist $500,000 to kill Emily. Details of time, place and character aside, this is the first truly major change from Knott's play and Hitchcock's film, in which the wife's lover and the hired killer were separate characters. As in Dial M for Murder, Steven has assembled blackmail material to pressure Shaw to do his bidding, but the fact that Shaw has an existing, intimate relationship with the intended victim clouds the character's portrayal, even for an actor as skilled as Viggo Mortensen. As for Emily, no actress on the planet—not even Meryl Streep—could convincingly play a supposedly intelligent and accomplished woman who has cluelessly fallen for both a husband and a lover willing to murder her. As in Dial M for Murder, Steven has planned in detail how his wife should be killed in their apartment while he is out for the evening, in what will appear to be a botched burglary. The plan goes awry, and the lead detective investigating the case, a Palestinian American named Karaman (David Suchet), senses that something is off but can't say what. He and Emily establish a bond, however, when she speaks to him in Arabic. By this point, though, A Perfect Murder has broken off completely from its source material to follow its own loopy path designed for short attention spans. Motivations and agendas tumble, reverse and collide with such breakneck speed that, for example, Emily leaves Steven, investigates him (illegally), reports him to Det. Karaman and then reconciles with him, all in the space of what appears to be about two days. While it may be true that the rich are different from you and me (as Det. Karaman's partner reminds him), it's still a requirement of good screenwriting that a character behave with enough consistency to remain credible, and Emily fails on that point even worse than Shaw. Steven is the only member of the triangle who makes any sense, but it's one of Michael Douglas' weakest performances. Douglas' gift is to make villains and rogues appealing. With a little more magnetism in the character, we might at least be able to see what attracted Emily in the first place. But Douglas might as well have a twirling mustache in The Perfect Murder. When he tries to smile, he looks like he's preparing to dine on someone.